For years, Laird & Associates, PC has been providing quality, personalized financial guidance to local individuals and businesses. Laird & Associates, PC's expertise ranges from basic tax management and accounting services to more in-depth services such as reviews, financial statements, and financial planning. Laird & Associates, PC is one of the leading firms in and throughout Colorado Springs. By combining our expertise, experience and the team mentality of our staff, we assure that every client receives the close analysis and attention they deserve. Our dedication to high standards, hiring of seasoned tax professionals, and work ethic is the reason our client base returns year after year. Our mission is to help clients maintain financial viability in the present, while taking a proactive approach to achieve future goals. This requires open communication to reach an understanding of our clients' needs through research and sound analysis. Laird & Associates, PC is dedicated to meeting these goals with high standards of excellence and professionalism. We have been a staple of Colorado Springs's business community for years, and pride ourselves on the level of esteem we have earned. Our dedication to hard work has earned the respect of the business and financial community in and around Colorado Springs. We believe this to be a direct derivative of our talent and responsiveness to our client base. Whether you are a current or prospective client, rest assured that individuals and businesses who choose Laird & Associates, PC receive competent and timely advice. Jerry has lived in Colorado Springs since December 2000. 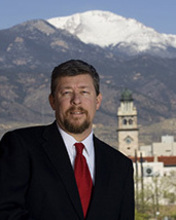 He has practiced public accounting in Texas and Colorado but serves clients from coast to coast and even abroad. He believes that long term relationships serve the client better than short term needs. As a result, many clients have developed into friends and continue to use his services even when states or countries apart. Jerry is a veteran, having served in the United States Marine Corps before returning to school to major in accounting. He has also worked in the private sector and appreciates the unique experience of having done so. It provides a different and valuable perspective as a trusted advisor to his public practice clients. His private sector experience has included such industries as utilities, real estate, agriculture, health care and non-profit organizations. Jerry has been married to his wife Carmen for more than 30 years and has 3 children ranging in age from 15 to 27 and also has 2 grandchildren. Jerry and his family enjoy jeeping, biking, running, skiing, hiking and camping in their spare time. Jerry and his family are committed to giving back to the community. They are involved with many non-profit organizations and serve on several boards to help promote and facilitate positive change in those they serve.